Good morning, Friends! 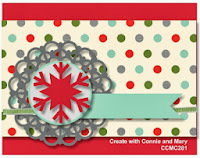 It's Thursday and time for another great challenge from the Create with Connie and Mary team! This week we have a sketch! Be sure to visit the Create with Connie and Mary site to see more wonderful inspiration! I hope you will find some time to create with us! We always love to see what you do with the challenges! Thanks for stopping by and have a super day! Wonderful card Deb! This Santa stamp is just so jolly! Love what you did with the sketch! 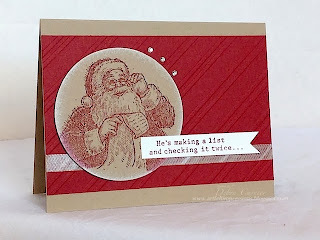 Deb, I love how you used Crumb Cake with this Santa and how it accentuates the vintage nature of the stamp!! The diagonal embossing on the background looks great here! Love your card! What a simple, vintage Christmas card you have created! When I saw this stamp initially, I thought..who would want to color that in all the time. But I love they way you and others have just stamped it in the red...no need for coloring! Perfectly simple! Love the effect of the "snow" around the Santa image, it's almost like he's peeking out of a window!